While paying for the convenience of a manufactured herbal extract or syrup can be nice, we have found that the best medicines are those we make ourselves. In addition, for those of us that incorporate herbal medicine into our daily diet, the costs really begins to add up. Making your own extracts and syrups will save you hundreds of dollars. In addition, you can make extracts that meet the specific needs for yourself and your loved ones. This recipe is the simplest way to make your own liquid herbal extracts in your own home. 1. Start with a clean jar that has a tight fitting lid and the herbs of your choice. If you can use fresh herbs, then fabulous! Fresh material is always preferred but availability is determined by your local bioregion, climate, etc and many quality herbs may not be available. If you cannot locate fresh materials, be sure to get good quality, organic herbs from a reputable supplier. Note: Try not to use powdered herbs; they will be difficult to filter out in the end and the debris will settle in your final product. 2. Chop the herbs finely – a blender or coffee grinder works well. Then place the materials in the glass jar with a tight fitting lid, such as a canning jar. 3. Pour a good and strong grain alcohol, brandy, or vodka over the herbs. Completely cover the herbal material, and leave 2-3 inches of alcohol above the herbs. 100 proof alcohol is recommended, but you can also use grain alcohol. When using grain alcohol, mix it with equal parts of purified water to create 50% alcohol to 50% water ratio. If you wish to avoid alcohol, then vegetable glycerin or vinegar may be used. When using vegetable glycerin, dilute it with equal parts of water. Although glycerin and vinegar are not as effective or strong as alcohol, they do create milder extracts that are suitable for children or those sensitive to alcohol. If using dried herbs you will need to add more alcohol over the next day or two as the dried herbs absorb and expand. A good ratio for dried material is about 1 part herb to 5 parts alcohol, and with fresh material 1 part herb to 3 parts alcohol. 4. Cover with a tight fitting lid, shake well, and place the jar in a dark place. Allow the mixture to soak and macerate for 4 to 6 weeks. Shake every few days to help the alcohol extract the active constituents from the herbs. 5. After 4 to 6 weeks strain the herbs. Use a large strainer lined with fine mesh cloth or cheesecloth. Make sure to tightly squeeze the material to extract every precious drop from the cloth. Funnel the material from your larger container into smaller bottles, preferably amber bottles and store your tinctures in a cool dark place. 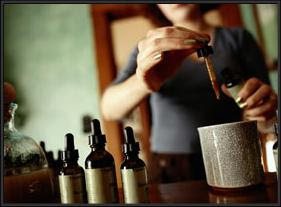 Your herbal tinctures will stay good for at least 3-5 years, if not indefinitely. 1. Simmer 2 ounces of herb in 1 quart of water over low heat until the mixture reduces down to 1 pint of liquid. 2. Strain the herbs from the liquid, and place the liquid back into the pot. 3. Add one cup of sweetener and warm over low heat until the sweetener and herbal liquid are completely mixed. Sweeteners used can be: honey, vegetable glycerin, agave nectar, maple syrup, or sugar. If using raw honey, be careful not to simmer or boil the syrup, as this will destroy some of the beneficial properties of the honey. In order to better preserve your syrup, 2 pints of honey may be used in place of the one cup of honey. 4. At this point, you may add a flavoring extract or fruit concentrate if you wish to flavor it. Lemon juice may be added for sore or tickly throats, or brandy can be added as a relaxant and preservative. 5. Remove from heat, bottle (preferably in amber glass bottles), and place in refrigerator. Your herbal syrup will last for several weeks to months within the refrigerator. Voila! You have now made your own remarkable medicinal herbal medicines for a fraction of the price you would have paid at the store. Enjoy! Me too. I love their herbs. Thank you so much for stopping by and for sharing on FB! Much appreciated!